As government wraps up the Chrysler bailout, Treasury says it likely lost $1.3 billion on the deal. NEW YORK (CNNMoney) -- U.S. taxpayers likely lost $1.3 billion in the government bailout of Chrysler, the Treasury Department announced Thursday. "The fact that the company has done so well -- that they were able to go out and raise private capital to repay us the loan so quickly, is really the big story," said Tim Massad, Treasury assistant secretary for financial stability. Fiat paid the Treasury a total of $560 million for the remaining shares, as well as rights to shares held by the United Auto Workers retiree trust. Fiat now owns a 53.5% stake in the company. Originally, the government committed a total of $12.5 billion to the struggling automaker, Old Chrysler, and the company's newly formed Chrysler Group. Of those funds, $11.2 billion have been returned through principal repayments, interest and cancelled commitments, the Treasury said. 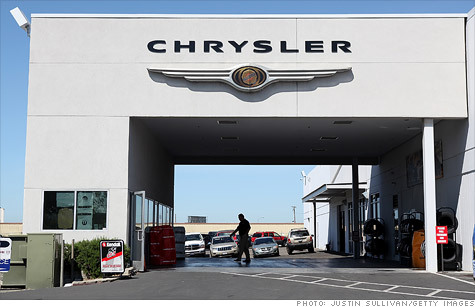 The new Chrysler Group paid back $5.1 billion in loans in May. As part of the loan agreement, Chrysler was given until 2017 to return the bailout funds. If it had taken the full term, the interest accrued on the loans could have significantly reduced the government's losses. Overall, $1.3 billion will not be recovered from the bankrupt Old Chrysler, but Massad still called it a "major accomplishment." That's because the government originally expected it would lose much more on the auto bailout. Initial estimates from the Congressional Budget Office in 2009, predicted the government would lose $40 billion on the overall auto bailout. Now it estimates, by the time the $80 billion program is completely wrapped up, taxpayers will have lost $14 billion. The Treasury Department also considers the auto bailout a success because the industry has recently shown signs of a recovery. In the year leading up to the Chrysler and General Motors' bankruptcies, the auto industry lost 400,000 jobs. Since the bailout, about 113,000 of those jobs have been recovered. "We didn't make the auto interventions to make money, we made them to save jobs -- and on that front, we dramatically succeeded," Massad said. General Motors (GM, Fortune 500) has already repaid loans it received from the bailout, but the Treasury still owns about one-third of GM's shares, worth approximately $16 billion. TARP overall, was originally authorized to cost $700 billion, but the Treasury Department has only paid out $411 billion. Of that amount, $101 billion have yet to be paid back, mostly due to losses from assistance to AIG and mortgage modification programs. The bank bailout part of TARP is expected to turn a profit of $20 billion, making up for some of those losses. Saab story: Will it survive?